GIVEAWAY time! People write me a lot about how to grow your hair long, and I think the major obstacle is not lack of horse steroids (I quit that racket? pls stop blowing up my pager) … it’s just that your hair looks unhealthy and/or breaks at the ends. CONTEST OVER THANKS FOR PLAYING. 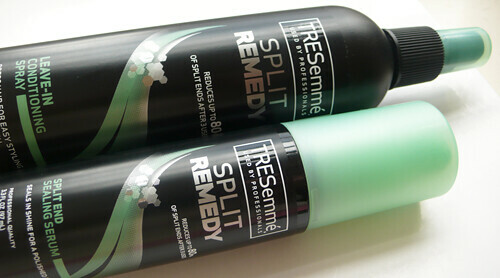 Enter TRESemmé Split Remedy. First of all, probably my favorite drugstore hair brand right now. Secondly, reduces up to 80% of split ends after 3 uses. The complete line includes shampoo, conditioner, leave-in conditioning treatment, leave-in conditioning spray, and split end sealing serum. All around $5! You can win the last 2, below! I’ve been using the line and I really recommend it if you either straighten your hair daily or have curly hair that you’re looking to tame. It smooths and adds weight to your hair, in a good way. TO ENTER YOU MUST COMPLETE BOTH OF THESE STEPS … PLEASE READ EVERYTHING BELOW. 2. Leave a DISQUS comment below [click through if you’re reading this in tumblr] and tell me - can you do the splits? And if not, at what age could you last do them? That’s seriously the question. For me, age 15 gymnastics era. Since then, not so much. Don’t comment in “Ask Me Anything” OR in the “FAN NOTE” area of tumblr <— guys, click through please, leave a comment on the blog not inside tumblr! Contest ends next Friday March 23, 2012 at 11.59pm Eastern. If you subscribe or follow to enter, you must be subscribed or following at the time of the drawing. Multiple comments DO NOT increase your chances of winning but love ya. Winner is drawn at random. Image: Paul de Luna for Fashion Gone Rogue, hair by Livio Angileri.